RAPID CITY, S.D. 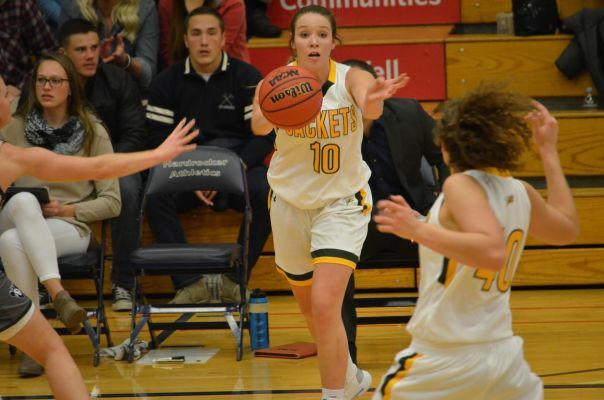 – Morgan Ham had a double-double, as the Black Hills State University women's basketball team took down South Dakota School of Mines, 70-43, to open Rocky Mountain Athletic Conference play on Saturday evening. Ham led the way for the Yellow Jackets (5-0, 1-0 RMAC) with her first career double-double, scoring 20 points and pulling down 11 rebounds. Katie Messler recorded 12 points, and Lyndzi Rich added 10 for BHSU. The Green and Gold is now 5-0 for the second straight season. BHSU has now won six consecutive RMAC regular season games, dating back to the 2017-18 season. Ham's double-double is the first recorded by a Yellow Jacket this season. The first half was a back-and-forth affair, with neither team able to take control of the game. Katie Messler scored the first two points of the game for BHSU, but South Dakota Mines (2-2, 0-1 RMAC) led, 14-13, at the end of the first quarter. The Yellow Jackets led by as many as four points in the second quarter, and led, 27-25, at halftime. The Hardrockers led, 32-31, with 5:52 left in the third quarter. The Yellow Jackets then used a 14-2 run over the rest of the quarter to lead by 11, 45-34, with 10 minutes to play. BHSU left no question in the fourth quarter, scoring the first 12 points of the period. The Green and Gold ultimately outscored SDM, 25-9 in the fourth. Morgan Koepsell scored all seven of her points in the final two minutes of the game to help put the game out of reach. BHSU shot 49.1 percent from the field (28-for-57), while SDM was 26.4 percent from the floor (14-for-53). The Yellow Jackets were 8-for-24 (33.3 percent) from beyond the arc, while the Hardrockers were 4-for-23 (17.4 percent) on three-pointers. The Green and Gold outrebounded SDM, 34-22. Sami Steffeck led the Hardrockers with 10 points. The Yellow Jackets have now won four-consecutive games against SDM, and have narrowed the Hardrockers lead in the all-time head-to-head series, 49-50.